Recently a wonderful company called Tropical Traditions sent me a jar of coconut oil to try and post about. This was perfect timing as Shannan had just written her post about the health benefits of coconut oil and I really wanted to try it for myself. I could begin and end this post with the simple statement that I absolutely loved the product, but I should tell you more about them. Brian and Marianita Shilhavey started the company in 1998 when they moved back to Marianita's hometown in the Philippines. Marianita had grown up on a coconut plantation and used coconut oil her entire life growing up. She watched the tremendous health benefits it bestowed to her friends and family. She knew how to extract the oil the traditional way not using machines, heat, or refining. 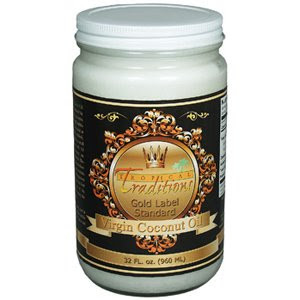 Tropical Traditions still extracts all of their coconut oil this way. I loved the coconut oil. I put it in smoothies. I cooked with it. I used it for baking. Just ask my son, it made the best scones. I used it on my face and body for lotion with great results. My feet have never been so soft and smooth. I haven't used this coconut oil long enough to experience all of the great health benefits listed in Shannan's post, but I can tell you that Tropical Traditions has a great product and if you are interested in trying coconut oil, you should check them out. Brian and Marianita also sell a wide variety of other high quality products. In addition to their coconut oil they have added many other healthy organic products to their website. These include things like teas, spices, pasta, household cleaners, and skin care products. Check out their website. 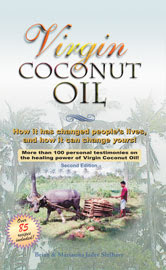 If you are interested in doing some deeper reading on the health benefits of coconut oil, let me recommend Brian and Marianita's book entitled Virgin Coconut Oil. The book begins by telling the story of how Tropical Traditions got started. It then goes into great detail describing all of the health benefits gained by consuming coconut oil and gives great testimonials from real people who have experienced changes in their health after consuming the oil There are chapters on improving your thyroid health, ridding yourself of Candida infections, and even using the oil to improve your pet's health. It contains over 85 recipes and ways to use coconut oil. It's a fantastic resource. I'm really starting to use it for a lot of things now... Love coconut oil!